This exquisite exhibition provides an intercultural exchange and understanding of a world whose cultural traditions have been diminished and often lost through colonization, gentrification and globalization. The diverse works are a way to immortalize these indigenous peoples and traditions through art.Each artist has been transformed through unique experiences having traveled the globe. Their works celebrate the people, customs, traditions and way of life of world nations whose cultural history and contributions are stunning, vibrant and reflects the richness and diversity of Indigenous cultures and the distinct differences between nations, languages, and geographic landscapes. The story of the way these art forms are produced runs parallel to the history and experiences of the artists themselves. It reflects customary trading patterns, a struggle for survival and the influence of governments and churches. 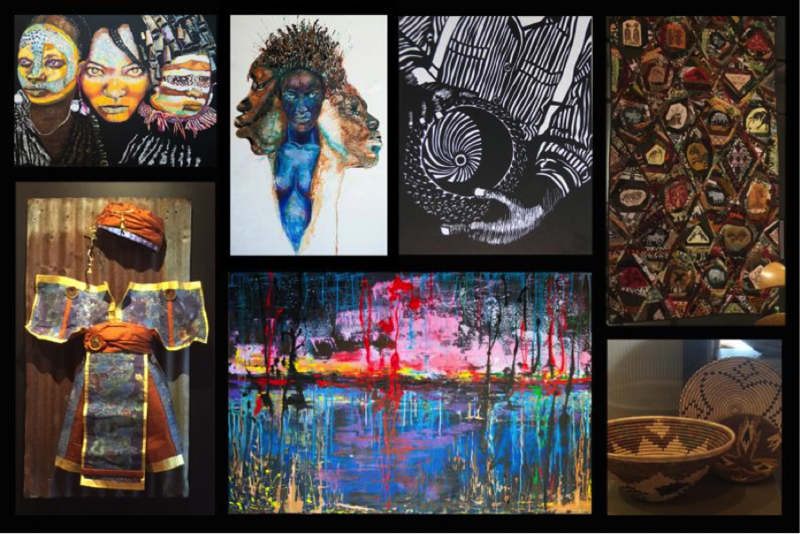 Through textiles, stone, acrylic, basket weaving, fiber arts, woodblock printing, batik, and mixed media these indigenous art forms have influenced the artists and are celebrated through their work. I am a newly retired and have spent the last several decades as a US Diplomat. During an earlier assignment in Namibia, I became fascinated with the hand-carved wooden printing blocks of Oshiwa Designs. As a result, I’ve specialized in making fiber art pieces with my hand-stamped fabrics for the past several years. The traditional Oshivambo designs that inspire the carvers resonate with African fabrics I bought in the street markets and my own painted and printed fabrics. The resultant work is my personal homage to indigenous African craftsmanship melded with new surface design techniques and lots of thread work. I am interested in realistic scenes of people working, charming old cars, interesting traditional kimonos, and celebrations of life and different cultures. While studying block printing with Denis Cunningham, I also fell head over heels for patterns, negative space and all aspects of block printing. The process is very labor intensive but the result is always a surprise, not always a good one. Block printing is exciting because it is a lesson in simplicity. Taking an image down to the most simple lines is often rewarding, often misleading. Being able to read a print the first time around is my goal. Before beginning my work in Creative Aging in Portland, I lived in Argentina, Malaysia, Siberia, Indonesia, Africa and Pakistan. As an innovative batik and mixed media artist, I have worked with some of the great traditional artists/craft-masters of the world. Everyday, I am inspired by the rich cultural traditions and artistic methods I had the opportunity to learn from my many years overseas. My art is not only a celebration of these ancient art traditions but to pay homage the people of these nations. I continue to create artistically today experimenting with paper, printmaking and mixed media in multi-dimensional pieces. At 70 yrs. of age, I am currently a senior student at Portland State University, painting major in art practices. Prior I was a consulting Printed Circuit Board Designer with extensive history in engineering training for my electronic design industry. My career led me to all corners of the world and it is there I encountered people, places, traditions, rituals that inspire my work. Categories: Exhibitions | Tags: Cultural Fusion, Geezer Gallery at Artist's Repertory Theatre, We Are Proud to Present | Permalink. Embrace Your Passions, Dream a New Dream, Never Stop Believing, Hope. Never give up, you can do anything you want as long as you stick to it. This wonderful gallery of art expresses just that, hopes, dreams and the passion to never give up believing for what a heart desires, it’s like a dream come true. It is with sincere appreciation from our sponsor Vital Life Foundation with support from Artists Repertory Theater that the Geezer Gallery is privileged to bring to you to enjoy and be inspired by, the art of Samuel Doney and Bill Stevens. Wishes connect seniors to people, purpose, and passions to eliminate feelings of isolation and help them live vibrant, purposeful lives. A true Wish of a Lifetime achieved makes other goals seem possible, and encourages our Wish recipients to keep dreaming and pursuing their passions. Jean’s style is impressionistic with strong design, vigorous brush work and luminous color. The work celebrates the desert spaces, coastlines and mountains she regularly visits. She shows her work in galleries in several western states. Besides successful one-woman shows, she had had her art published and has won numerous prestigious awards in juried shows. She is represented in private and corporate collections in the United States, Canada, and England. Alder Stage One of the most triumphant stories of the human spirit ever told, the soul-stirring The Miracle Worker evokes hope and inspiration for the entire family. With dignity, perseverance and respect in the face of seemingly insurmountable challenges, a child, a teacher and a family learn to communicate. A play based on the lives of Helen Keller, who became DeafBlind as an infant, and her teacher, Anne Sullivan, who enabled her to become one of the most influential women of the 20th Century. Click here for performance schedule and to purchase tickets. Categories: Exhibitions | Tags: Bill Stevens, Geezer Gallery at Artist's Repertory Theatre, Hopes Dreams and Passion, Jean Thomas, Samuel Doney | Permalink.